The item Bamboozled, Tish Rabe, (ebook.) represents a specific, individual, material embodiment of a distinct intellectual or artistic creation found in Charlotte Mecklenburg Library. Sally's stuffed bear Pammy the Panda is turning two, and Sally wants to give her a gift. But what kind of things do pandas like? Enter the Cat in the Hat. His friend Zhu Zhu is a real panda--he's bound to have some suggestions! 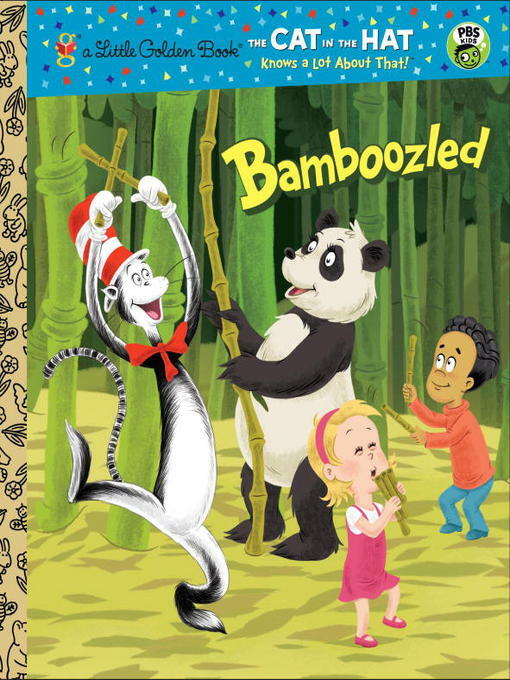 So off the gang goes to Bamwamabooboo, where Zhu Zhu teaches them about his favorite thing in the world: bamboo! Turns out that bamboo is not only a panda's favorite food, but it's an amazingly strong, lightweight, and flexible kind of grass--like the stuff on your lawn--that's good for building all sorts of things that humans like, too. Almost as much as they like a bargain--like a $3.99 Little Golden Book!